Rising Storm: Armored Assault Free Content Pack Now Available on Steam! Tripwire Interactive and Antimatter Games are pleased to announce the release of the Rising Storm: Armored Assault Free Content Pack. The new pack is loaded with free content for both Rising Storm and Red Orchestra 2 including a new gun (German MG 42 light machine gun), two new light tanks (Russian T-70 & German Panzer III) along with an updated version of Arad 2, and two new official custom maps (Kobura & Tula Outskirts). We’ve put together an action packed new trailer for the update that can be viewed here. The Rising Storm: Armored Assault Free Content Pack is available now on Steam as well as many other digital outlets. 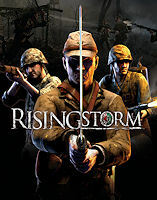 Rising Storm is also on sale at a 75% off discount during Steam’s Midweek Madness Sale! More game information is available at the official Rising Storm website.